Add the shrimp to a gallon-sized zip lock bag or medium-sized bowl. Add olive oil, honey, garlic, ginger, jalapeños, cayenne, cumin and coriander. Toss well to combine, seal the bag or cover the bowl and place in the fridge for 15-30 minutes, or up 24 hours. Heat a large skillet over medium heat. Once hot, use a slotted spoon to scoop the shrimp out of the marinade and into the hot skillet, and season with salt and pepper. Make sure to scoop up all the garlic, as well. Cook the shrimp until pink, for about two to three minutes per side. Add butter and a teaspoon of pepper (or more or less to your taste) to the skillet. Continue to cook the shrimp in the butter until the garlic begins to caramelise and turn light golden brown, about another minute or two. Be careful not to burn the garlic. Remove from the heat and stir in the coconut milk and basil. 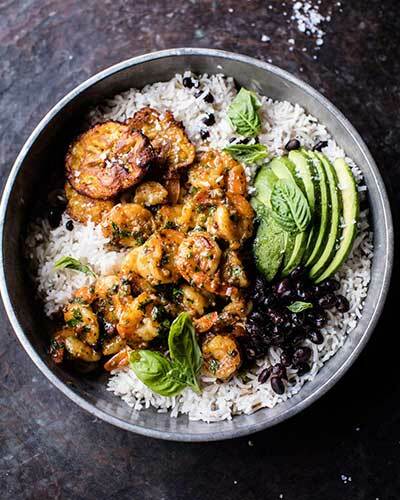 Serve shrimp alongside rice, black beans, fried plantains, avocado and lime wedges. Garnish with freshly chopped basil. Heat an inch or so of oil in a medium skillet over medium heat. Once the oil is hot add the plantains and fry for 2-3 minutes per side or until just lightly golden. Remove and drain on paper towels. Now transfer the plantains to a cutting board and, using the back of a wooden spoon, smash them down into round flat disks. Return the plantains to the hot oil and fry another 2-3 minutes on each side or until they are golden and crispy. Remove to a paper towel lined plate and sprinkle with salt. Chips are best eaten right after frying, but any leftovers can be stored in an airtight container at room temperature.